Apple's stock headphones aren't exactly the most-loved product in the company's oeuvre, even after Jony Ive's team revamped them last year. Yet they're free (with purchase) and produced by the millions. So Sprng, an inexpensive little plastic do-dad that makes them useful, is worth paying attention to. Sprng is the handiwork of Canadian product designers Ohm Industrial Design, whose founders were fed up with Apple's repeated attempts to make a solid pair of ear buds. Their main gripe concerned the ill-fitting shell, and the subsequent tendency of the 'buds to fall out of your ears at inopportune times. Sprng is a thin plastic stem that snaps onto the base of the newest earpod and anchors it in place, a bit like an extra leg on an unstable table. Why not just buy a better pair of headphones, you cheapskate?, you ask. Well, for one thing, the idea of throwing away a perfectly functional product offends the sensibilities of many—including the designers at Ohm—especially if it can be easily fixed. 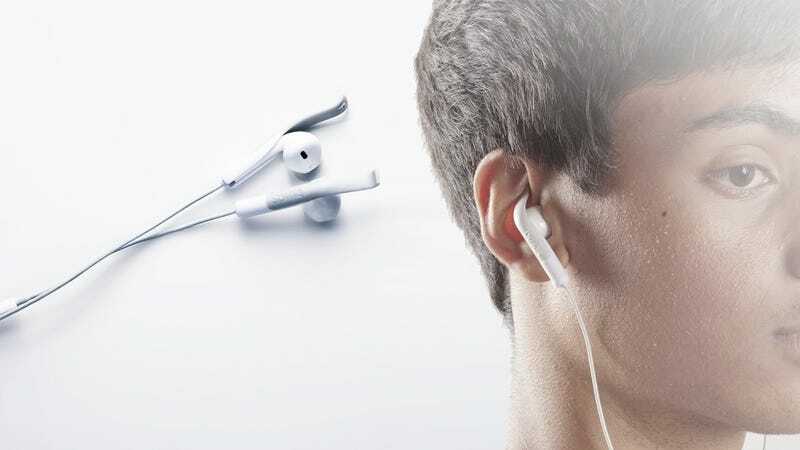 “With all the millions of ear pods that Apple gives away with their products, it would be a shame if people did not use them because they fall out," explain the designers on their website. "Accordingly, we decided to make an inexpensive accessory that wouldn’t distract from the clean look of the ear pods but kept them in your ears."